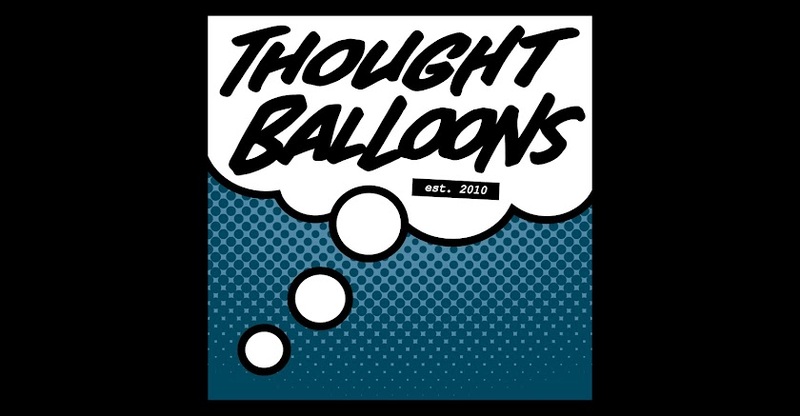 Thought Balloons - Creating Comics One Page At A Time: REBOOT: "...Baby Huey's Take." --David Press. Kind of a reboot on the Baby Huey comic and cartoon, but instead of Huey being a giant duck--he's a human. And kind of crass. 1.1: A desk sits solitary in the middle of a grassy plot of land. There's a typewriter on top of it and a sheet of paper. 1.2: A square plot of a garden: there are fourteen beds with various things growing out of it in states of spring renewal. 1.3: Panning to the left of the garden we can see a GUY in cargo shorts, t-shirt, and a baseball hat. He’s holding a WEED-WACKER and mowing down some weeds alongside a stonewall that extends up to a HOUSE’S white siding. 1.CAPTION: “I’m not going to lay down another metaphor for you. 1.4: As if we’re panning up from the GUY’s position, the white siding is the form of a BACK PORCH strung with lights. There’s a bench, two chairs, and a black table. Sitting on the bench is a WOMAN in dress clothes sipping coffee. 2.CAPTION: “Seasons change and we regrow and re-live. 1.5: Still panning upwards from the porch, we’re now looking into a SECOND FLOOR window. In the window, we can see a CRIB and the faint shadow of a baby looking out the window. 3.CAPTION: “The years change, but the word—‘REBIRTH’— is a lie. 1.6: Now we’re in the window at looking at the BABY in the crib. 1.7: And now out to the WIDE YARD again. In a hammock, is HUEY’s little sister reading a Winnie the Pooh book. 5.CAPTION: All we ever do is run around recycling the same things. Humans are no better than lemmings. 1.8: Back to Huey in his nursery he’s smashing his toys against the rug and laughing about it. 6.HUEY: They’re all just toys. Toys get broken and then you get a new one. 6B: Why cry about it?